Behold! What if each San Francisco neighborhood were an island, and the streets canals? Click image to zoom. Posters now on sale! Regardless, a handy reference. Backstory here. 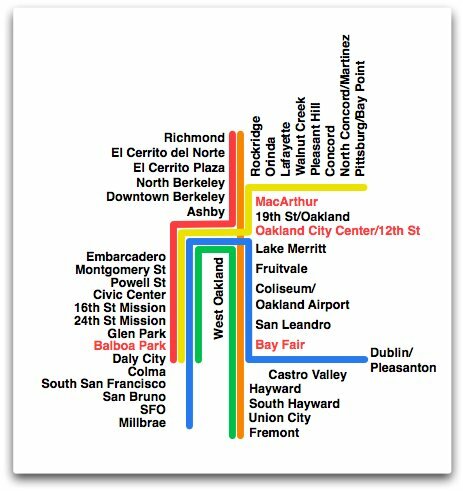 Other exciting posters include my Hyperlinear BART map (black-background also available, along with matching t-shirts). Cool! NIcely done, glad you could use it. Soon. Gotta fire up the map-making machine and add the bell-shaped St Mary’s, and see if anything else comes to mind. Stay tuned! (or follow on Twitter). Will try to remember to email you too. Cool! Can you take a picture? I haven’t seen it yet. They paid me to use it, but they changed the colors, so I was like whatevs. Also, use of art != endorsement, etc. I would have voted for @mat. There’s also another SF entity that will be using it as a big 10’x10′ public display, will let you know the details when it’s ready. One thing is always that one of the most widespread incentives for applying your cards is a cash-back and also rebate present. Generally, you’ll get 1-5% back upon various acquisitions. Depending on the cards, you may get 1% returning on most expenses, and 5% again on buying made at convenience stores, filling stations, grocery stores along with ‘member merchants’. Between T-Hill and the Financial District is Jackson Square. It’s on the National Register of Historic Places and deserves to be added to this map. thanks — stupid typo I made keeps on popping up on preview images. accurate on poster! Also, it is not Miraloma…it’s Miraloma Park. Great stuff. Well done. Thanks for the creativity. When will it be available in poster and or t-shirt form? 1. Please don’t forget our “real” islands – Alcatraz and T.I.! 2. Any way you can add SFO, which is officially SF real estate? 3. Would love to see an island/yellow spot for SF Gen’l inside the kink that I believe is Hospital Curve in your canal between Potrero and Mission. 4. Inner Mission and Outer Mission? Thanks! Tried printing a shirt but just couldn’t get the resolution on the text. Posters have been available from the start, see Zazzle link. Real islands are outside the scope of this squarish map. Good point on SFO but that’s not going to make it in. Outer Mission is there. Not subdividing the Mission further, alas. Trivia: SF has quite a few real islands. I believe the Farallons and part of Red Rock island (near Richmond Bridge) belong to the city and county of SF, and so does the tip of Alameda island. Also, if you’re including the exclave of SFO, you have to count the Sharp Park golf course in Pacifica, and maybe the jail in San Bruno. Your map is outstanding! St Mary’s Cathedral on Geary/Gough – aka cathedral hill – has been compared to a Maytag washing machine – love your idea of bellshaped. Bravo! 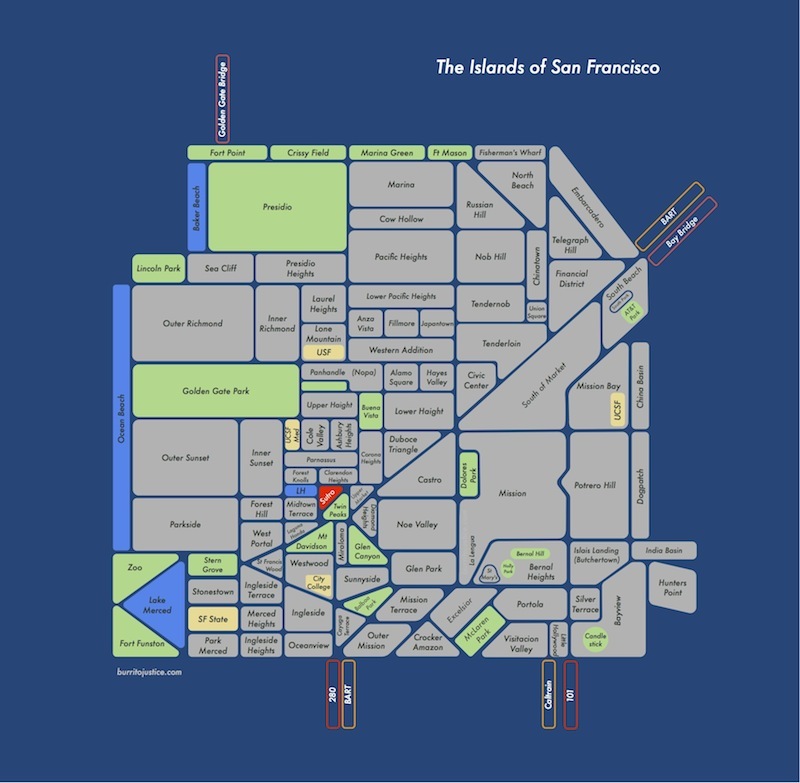 I want to purchase the Islands of SF poster and customize it Do you have any examples of texts or images. We live in LA now, but would like to capture that we lived in the Marina …”we lived here” or “our hood” text? Need a better suggestion. Thanks.